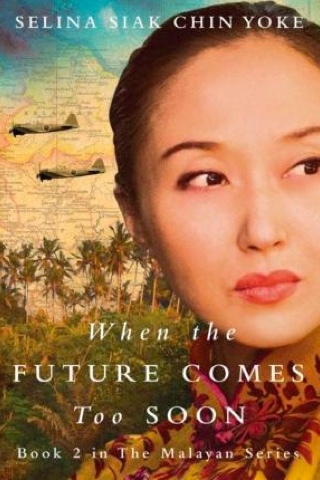 Covering a period in a setting rarely covered in English-language literature, When the Future Comes Too Soon, by author Selina Siak Chin Yoke (born in Singapore when it was part of Malaysia), is a welcome fictional tale of Mei Foong and her family during the Japanese occupation of Malaya—today’s Malaysia. Mei Foong is pregnant with her fifth child when the British evacuate from Malaya and the Japanese invade, forcing her family to flee from Ipoh to relatives in the countryside by night as bombs fall by day. Once the Japanese establish themselves, the family moves back to town, and Mei Foong struggles to feed her family as she discovers that her British-educated husband, who finds work with the Japanese, prefers listening to music and gambling than paying attention to the practicalities of life during the occupation. With her husband glued to the gambling tables, she spends innocent time with another man, and continues to do so when her husband is sent away to recuperate from pneumonia. After the Japanese surrender, things come to a head, and Mei Foong’s life takes an unexpected twist. This is the sequel to The Woman Who Breathed Two Worlds, which we have not read, but this book stands on its own. We wanted to jump right in as we were eager to read more about the period we so enjoyed in Tash Aw’s excellent The Harmony Silk Factory. Cinematic in both plot and description, When the Future Comes Too Soon is strong when it comes to describing the conditions under which the Malayans lived under the Japanese, as well as the constraints of traditional Chinese marriages (or at least, those where Confucian values are cherished, as some of Chinese heritage no longer considered themselves close to China). Inflation skyrockets so high that eggs eventually cost $28; the Japanese open gambling houses accessibly by all (not just the Chinese, as was the case under the Brits) with the objective of taking money out of circulation to help tap inflation down. We did wonder how much the family's servants were being paid, given that they were able to be kept on while Mei Foong otherwise needed to pawn her mother-in-law’s jewellery to pay for her husband’s medicine when he falls ill. Historical details are not laid on too thickly, but create enough of a mood that evokes the era, allowing the story to focus on the tensions between the characters instead. We liked the light hand used to explain what a five-foot way is, who the Nyonyas are, and how permanent waves were popular back then. The story’s weakness, though, is in quite a lot of telling rather than showing. The character development and relationships occasionally seem forced, with Mei Foong and her husband barely seeming to speak, and her interactions with her children, who must have been a handful, brushed over. There is an unintentionally humorous line very late in the book when Mei Foong claims her daughter is on her mind “every year on 12 March, her birthday”. Her eldest daughter is grown up by this point, but still, one might think she’d think of her more often. Mei Foong is not an entirely likeable character herself, prone to talking about her appearance during times of crisis, when you’d imagine she’d have other things on her mind. But her strength in difficult times is clearly portrayed. Read this book if you have an interest in knowing the personal impact of the geopolitical forces that shaped Malaysia’s history. Mei Foong, for instance, was so angered at one point by the refusal of her husband’s Japanese boss to help them when he is sick that she tells us she never buys a Japanese product for the rest of her life. Countries might surrender, and wars officially end, but the effects of war linger for generations. And truly, don’t be surprised if this gets made into a film!